Today may’ve been my second best Melbourne Cup day ever. I was sober (no hangover). I wore flats (which means my feet don’t hurt). I placed no bets, not even in a sweep (bank balance intact). I didn’t have to pay for an expensive function or track entry ticket (I’m going to donate some money to Pegasus instead this year). I arrived a minute or so after the race had started (given how long it lasts, not really an issue). I remained oblivious to the name of the horse who won until I listened to the 5pm news on the way from the track to the Realm (what was it again?). Pictured above are Sophia Haridemos, Cynthia Jones-Bryson and Melba Haridemos at the Hyatt. Ms Jones-Bryson is an award-winning milliner who will on Thursday judge the millinery award at Oaks Day at Flemington. The hats that she and Ms Melba Haridemos are wearing are her own creations. Danielle Ridgway and Alyse Allender. 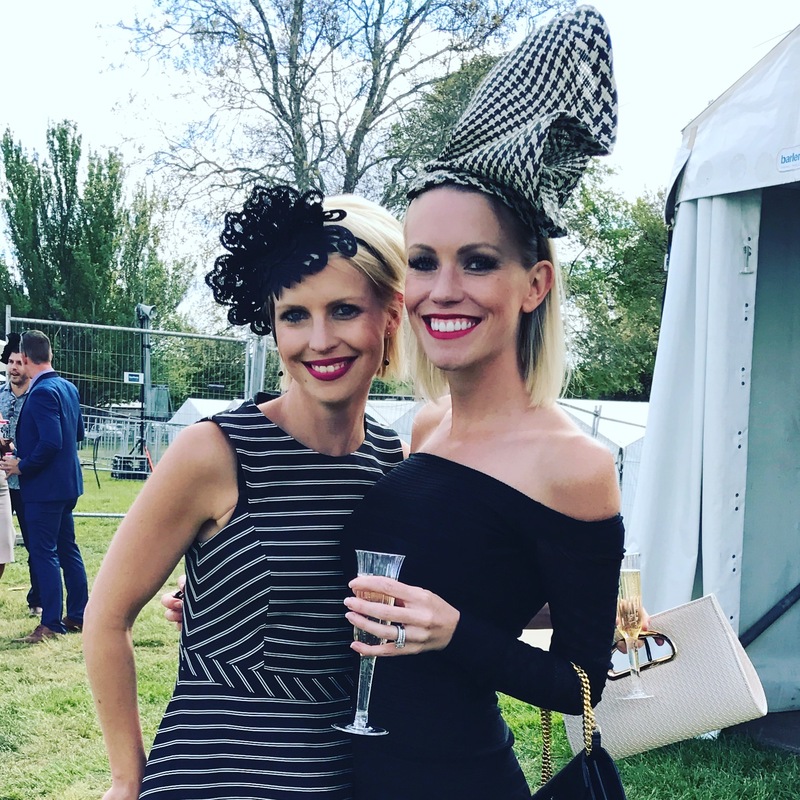 Ms Allender created the fascinator her sister is wearing and her own stunning hat. Check out all of our fashion snaps on Instagram here. I spent the two hours from 3pm exploring functions at the Hyatt, at Thoroughbred Park and at the Realm, checking out all the fashions (hats were the star), comparing the offerings at each of the venues so I know where to head next time I have a day off work on the first Tuesday in November, and meeting dozens of interesting Canberrans. It was my job to people watch on the best day for people-watching all year. Elizabeth Krijnen and Hamish Lardi trackside. Mr Lardi was runner up in the men’s Fashions on the Field competition, though he pointed out he’d returned some of his accessories to the car by the time we arrived with our camera. For the record, I thought the garden function at the Hyatt looked like the place to be, for food, atmosphere and sunshine. The Realm was buzzing but very crowded. There was lots to see at the track, but none of the venues there were as appealing as either of our top hotels when you looked at them closely. 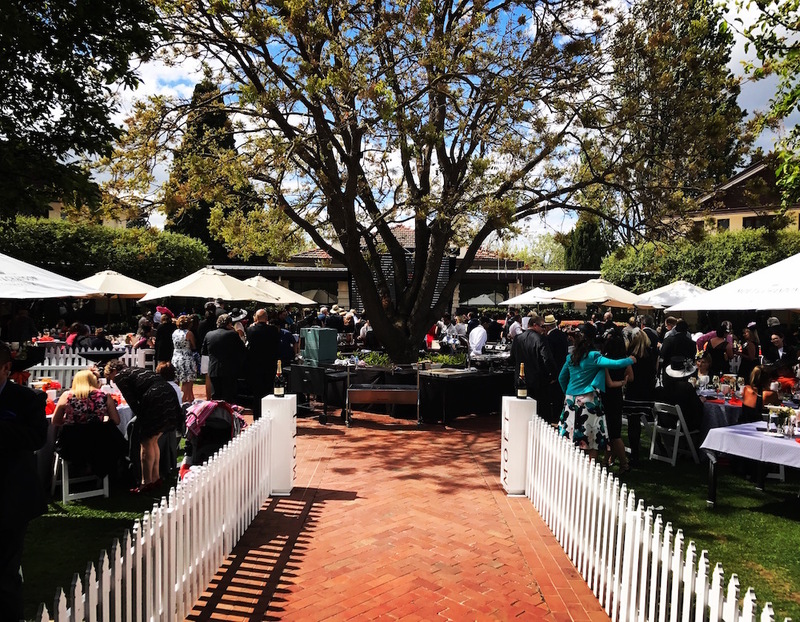 The garden function for Melbourne Cup Day at the Hyatt. It sure beats my worst Cup Day ever, which involved inviting another friend who worked alone to come watch at my ghost town of an office (where there was no TV), discovering there was at that time no option to view the race online, stumbling into the bowls club next door only to be glared at by the staff and regulars the entire time as we watched the race, skulking out of there and sitting back down to work all alone. 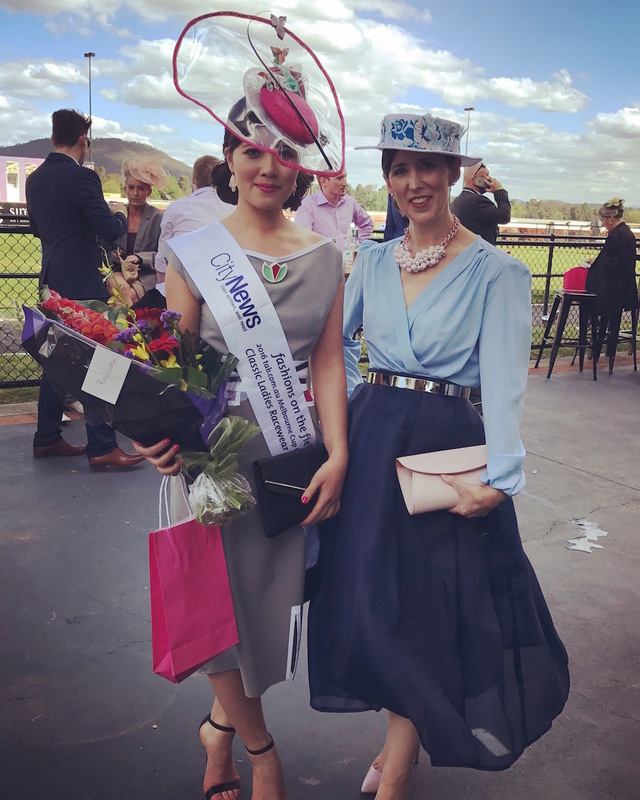 Stephanie Kwong and Sally Martin at the track after Ms Kwong’s win in Fashions on the Field. She is wearing a Sovata ensemble while Ms Martin is wearing a skirt she created herself, a vintage blouse and a hat by Bywong milliner Barbara Burton. A surprise successful viewing took place in November 2012. I was 38 weeks pregnant, wearing runners, leggings and a faded hand-me-down maternity t-shirt that may’ve been purple once. I was on my way home from picking up an air conditioner from Harvey Norman at about 2.50pm when I remembered it was Cup Day, so bolted into the nearest venue with TVs, Gryphons at Griffith shops, and serendipitously ran into friends who kindly (and despite my atrocious attire) invited me to join them for the race. I think I even had a champagne and orange juice. 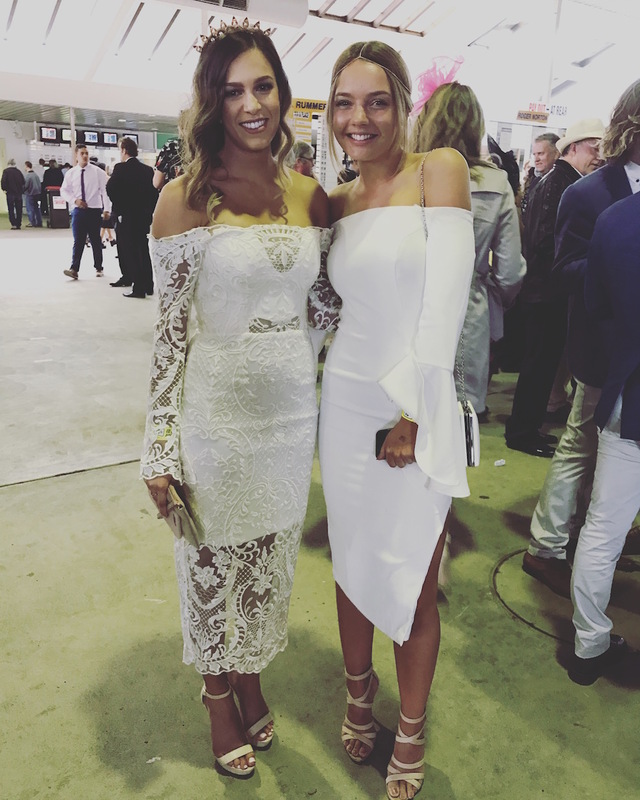 Georgia Wood and Jemma Griffiths were the belles of the betting ring. One of the best ever race interludes was back in the late 1990s at Darling Park. I was working for The Sydney Morning Herald in the IBM building overlooking Darling Harbour and worked through lunch. Five minutes before the race, we were all invited down into the lobby of one of the complex’s buildings to watch the Melbourne Cup on a big screen. There were hundreds, perhaps even thousands, of pre-poured glasses of sparkling set out on tables all around the room like something out of a fairy tale, crowds of friends and colleagues to cheer with, sweeps pre-arranged, and no guilt about being away from the office too long because it was only one lift-ride away. An old friend is a member at Flemington and took me to the track with her about ten years ago. I remember being astounded that there was a train that took us all the way from the city to the racecourse. I will never forget the complete stillness and silence in the moments before the race began, nor the roar of the crowd as the horses came into the home straight. The members area was much more glamorous than what’s on offer at Thoroughbred Park, as you’d expect, though the public areas were filled with drunken revellers falling over in the gutters at the end of the day just the same as here. 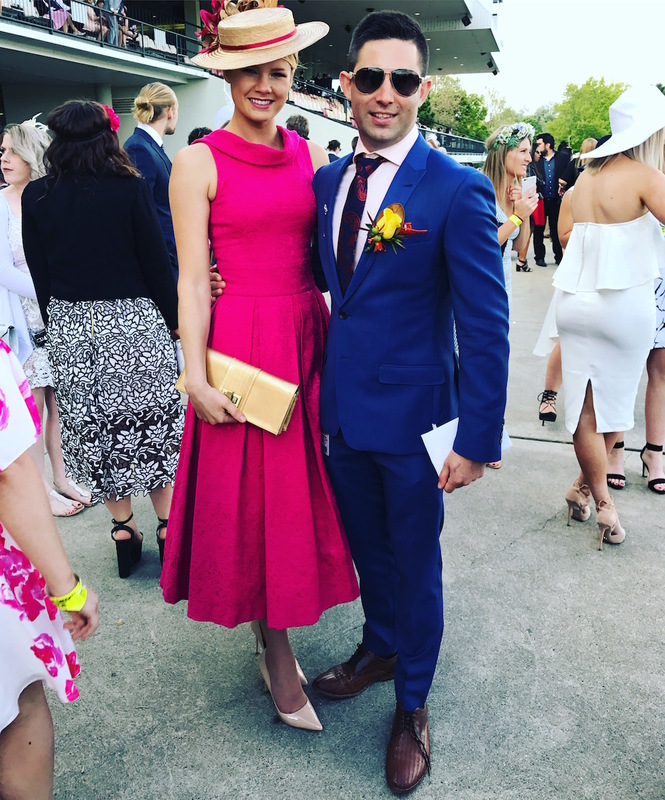 How did you celebrate Cup Day? Did you dress up? Did you win or lose money? How will you do it differently next year? How’s your head today? 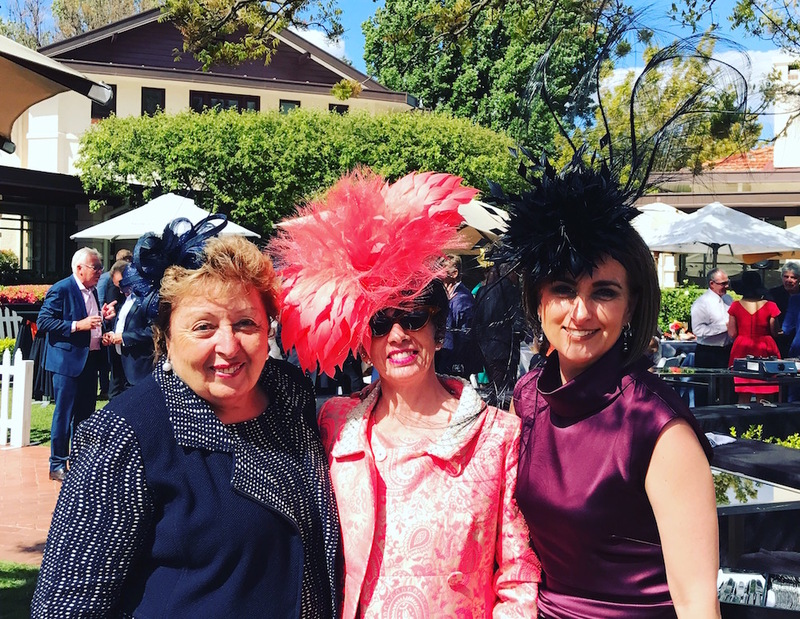 Glamourous, sustainable racewear fashion from some of Canberra’s best!